August 11th after the snow melted. My two grandsons, (L to R) Jared and Nathan. Beautiful sheep country. In ’83 I started guiding and every year for the next twenty-one years I celebrated that day by climbing mountains. I have never personally killed a sheep on my birthday but six out of the 25 sheep clients that I personally guided did. Those were all special days but mainly as I got older all I could think about that morning when I put my pack on my back and started up the mountain was, “man I’m getting old.” I hung in there but there was just something about that first climb of the year bringing back all of those old tough climbing memories and knowing that yes, “I am a year older.” I guess it’s more of a mind thing. Karen would always make it special by making me my favorite chocolate chip cookies, along with a card for me to take in my pack. I would share a few of them with my client during our climb the first morning but after that I kept them hidden for myself. Besides, the clients had plenty of store bought cookies. 1985 was a different kind of birthday as I spent it in the tent with my client Tom Heller from Texas while it rained 52 hours straight. We ended up naming our Canyon Creek camp, swamp camp, as the strip ended up with two or three inches of water on it. This was the first and last time that water got on the strip in the following nineteen years. I became fond of that camp and spent many birthdays there including my 40th, 50th, 60th and 70th milestone birthdays. Tim Orton and me with his beautiful 40" ram. 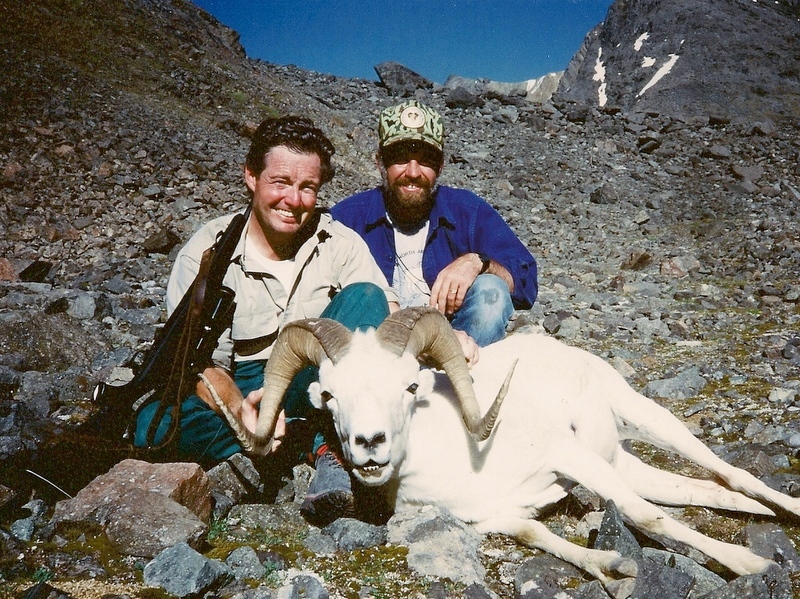 In 1986 Tim Orton from Minnesota returned to hunt sheep with us and was the first to harvest a 40” ram on my birthday. He took that one in the Canyon Creek breaks. It was a one shot kill which was different from the previous year where he missed a heavier based 40 ¼” ram that scored 165 B&C points. We hunted the rugged Canyon Creek Glacier area that year. Paul Claus found that sheep the following winter. It had been killed by a wolverine. The next client to celebrate my birthday with a ram was Leonard Anderson from West Virginia. It was ’88 and we were filming our new marketing video when Leonard harvested his heavy 40” ram. You can see that kill by watching the video, “Hunting Alaska with AAA Alaskan Outfitters” on my blog. Leonard had previously hunted with us in our Western Alaska Area in ’87 taking a B&C Record Book caribou, a moose and a brown bear. John Bermen and me with his 39 incher. In ’90 John Bermen and his wife Pamela spent a very long August 10th crossing the pass from swamp camp to the Canyon Creek Glacier and returning to camp at 3:00 AM. It was a long and hard day but it payed off with John harvesting a beautiful 39 incher. That heavy pack back over the pass in the dark really made me think I was for sure getting older and I was only 46 at the time. John first hunted with us in ‘88 at our Cold Bay area where I guided him to his B&C Record Book 10’5” brown bear. I received a Remington Model 700 mountain rifle from the Foundation for North American Wild Sheep organization as an award for guiding on the Alaska Professional Hunters Association’s Outstanding Animal of the Year. I had the stock cut down on that rifle for Karen. She used it to take her B&C Record Book caribou. Mike Sweeney and me with his 37" ram. In ’92 I celebrated with Michael Sweeney a young client and his father from Massachusetts. He scored with a very nice 37” ram. The hunt was a high school graduation present from his parents. Mike had come on a 2x1 sheep hunt with his dad a couple years earlier and wasn’t feeling well during the hunt and didn’t take a ram. His father harvested a 36 incher that year. Mike later hunted brown bear at our Cold Bay area and harvested an 8 ½ footer. That was a college graduation present from his parents. John Herr and me with his 39" ram. In ’93 I hunted out of our Young Creek camp with John Herr from North Dakota. A band of rams were right above camp so we had to wait for them to move out of sight before we could make that perfect stalk which we did and John shot a really nice 39 incher around 3 PM. After pictures and skinning him out for a life size mount we were back at the tent by around 9:00 PM to celebrate his sheep and my birthday. I had guided John on a previous hunt in our Western Alaska area to a 426 point B&C Record Book caribou. That was the largest caribou that I ever guided on. Jerry Lawson and me with his 37 1/2" ram. He was wearing Jerry Moore's shirt. 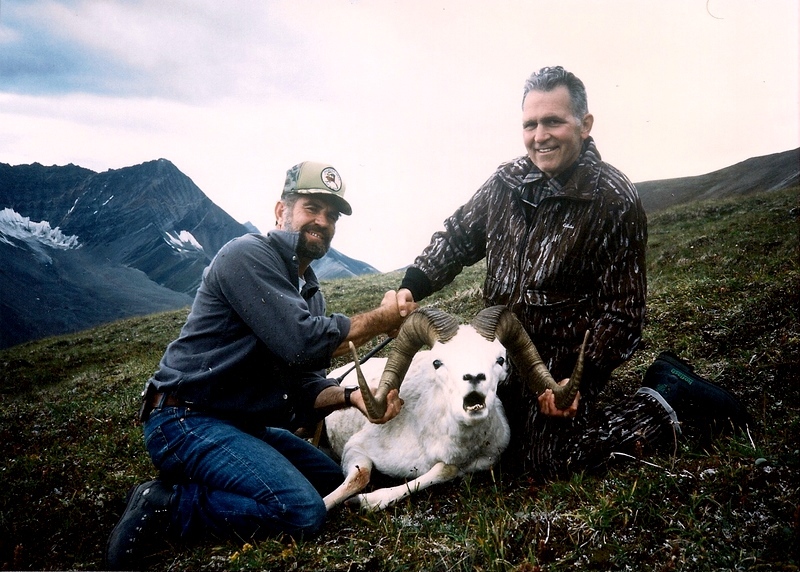 My last birthday celebration with a sheep client was in ’98 when I guided Jerry Lawson to a nice 37 ½” ram. You may remember him from my story “Hunting Partners” where his partner Jerry Moore passed away while preparing for this hunt. This sheep was in honor of Jerry Moore which made the day even more special to me. It however was Jerry Lawson’s last big game hunt. He just didn’t want to hunt without his partner. The two tents after the snow had melted and everything was dried out. The green tent was the "leaker." My last sheep hunting birthday celebration was three years ago, when I turned 71. I was hunting with two of my grandsons, Jared and Nathan and my son-in-law Sagen. It was Nathan’s first sheep hunt and he was to be the first shooter. However, Mother Nature had other ideas. We woke up to a snow storm with about an inch or so on the ground and it was blowing and snowing hard so we had to stay in our tents, two two-man back-pack tents. The one Sagen and I were in was still a good waterproof tent. The boys however, were in my 33 year old Eureka pop-up. It was a great tent back in the day but as the snow turned to rain it began to leak, especially the area below the fly. The boy’s sleeping bags were against the end of the tent and sometimes touched the sides of the tent so they were getting pretty wet. This lasted most of the day so not only were their sleeping bags wet but most of their clothes were also. Needless to say, they weren’t happy campers. I really couldn’t blame them knowing I don’t like to be wet. So there wasn’t much of a birthday celebration. August 11th was better but not a good drying day. We hunted but the following day we headed down to what we called our base camp to dry out. It started raining in the higher elevations the next day so after getting wet again the boys decided we should call it quits. It certainly wasn’t a good start to fire someone up on sheep hunting. (L to R) Sagen, Jared and Nathan on our way back to camp. As you can see most of my birthdays were spent working hard and having fun but one of the most memorable birthdays wasn’t mine but Brent’s, September 16, 1984. It was our first year in the guide business. We ended up spending five hours in a snow storm on the side of a mountain pinned down by a band of rams that were lying on the ridge above us. We were with Phil Alward and John Kliegl, two clients from the east coast. Dan Schwarzer was also with us. It was Dan’s first time working as an assistant guide. To keep from freezing we moved out of sight of the rams leaving one of us to watch them while the others walked in a 40 foot circle over and over. We took turns being the lookout. We were truly miserable, wet and cold with the wind blowing and the snow stacking up. To make matters worse the sheep ended up slipping out on us so it was all for nothing, at least that day. The following day however we caught up with them and Phil harvested a super nice 38” ram. For years whenever we looked up on that mountain we could see our trail or circle that was made by five cold hunters walking around and around. Not a good way to spend your birthday!! (L to R) Brent and Dan cold, wet, having fun. As I get older I still hope to spend many more birthdays chasing sheep in those beautiful mountains.